Episode 19: The Disney Ice Cream Polar Vortex! 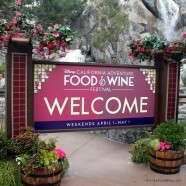 Welcome to Episode 29: Disney California Adventure Food and Wine Festival Review! In this podcast DFB Disneyland columnist Heather Sievers joins AJ to chat about the Disney California Food and Wine Festival, which just returned to Disneyland Resort after a 5 year hiatus! We were SO excited to hear that the festival was returning to Disneyland, and this year they added marketplace booths — similar to what you’ll see around World Showcase at Epcot’s Food and Wine Festival — for the first time!